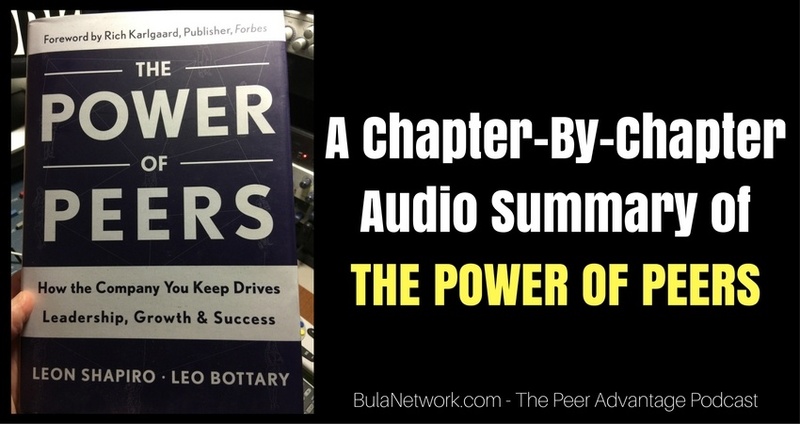 Today, we wrap up this series of our chapter-by-chapter audio summary of the book THE POWER OF PEERS with a conversation recorded with co-author Leo Bottary. The interview was recorded using a video conferencing platform and the video is available at YouTube (or obviously here below). In the conversation we talk to Leo to get a sense of who he is and how he came to be interested in peer advantage. We also discuss some insights he’s gained over the last 18 months or so since the book was published. Leo also tells us a bit about the new book he’s working on, due to be published in the Spring of 2018. It’s a conversation that I hope brings you some insights on why you may want to consider embracing the peer advantage into your life and your business. The interview starts at about 2:30 minutes into the show and it ends around the 40 minute mark. At Leo’s new podcast – YEAR OF THE PEER – we’ve encountered some terrific guests from varied backgrounds and fields of accomplishment. In each case, we’ve found our guests at that podcast to be gracious and giving. None of them silo’d themselves toward success. They each encountered mentors and guides along the way. Your success – and mine and everybody else’s – is going to largely depend on the people we allow into our lives. Some of those entrances will happen organically. Some, by way of sheer serendipity. But to think that our lives are left to mere random chance is delusional at worst, naive at best. Leo’s podcast tagline is, “Who you surround yourself with matters.” The noun is YOU. The verb is surround. It’s purposeful. Intentional. We live in one of the greatest eras ever. We can quickly and easily find and connect with people who we think may be able to help us – and people we may be able to help. It’s our fault if we don’t seize those opportunities. I’ll go you one better – it’s our fault if we don’t create those opportunities because they’re all around us. As Leo and I talked you likely got a sense of how our humanity is at the crux of the peer advantage. That’s because it’s true. Leo is no more defined solely as a co-author of a book, THE POWER OF PEERS, as he’s only defined as the host of a podcast, YEAR OF THE PEER. He’s a husband. A father. Now, a grandfather. Those are just 3 roles that he and I share. We’re both Baby Boomers. Yet we’re as different in many ways because he was born in one part of the country, me in another. Our careers paths are nothing alike. But in spite of whatever differences may separate us, we choose to surround ourselves with people that include each other because there’s mutual benefits as we’ve discovered our own peer advantage. It was a very intentional, purposeful connection. Leo didn’t know me at all. Except for his name on the front of the book, I didn’t know him at all. It may seem to you as a bold step, but to me it was so non-threatening that I had no reservations in reaching out to him about helping him create his own podcast. I only share that to inspire you to not wait. Don’t delay in reaching out to people you think may be able to join your pursuits. And people who have a pursuit you may find worth joining – like I did with Leo. It wasn’t about me. It was about the pursuit of finding out more and being part of this movement. The Peer Advantage. Leo popped on my radar as I saw him appear on a few shows where the interviews were available online. I looked and couldn’t find any platform where Leo was the host. He was always the guest. I saw an opportunity that he may or may not have ever seen. I’ve been podcasting and participating in new media for many years. I had something to offer him, something that wasn’t beyond his capabilities to learn, but something I could do where he wouldn’t have to learn it. He just needed to get to know me so we could develop some mutual trust. There are the first two elements of peer advantage contained in the book: 1) select the right people (I selected Leo and he selected me in return when he said “yes”) and 2) create a safe environment (Leo had to develop trust in me and I in him; we did and you can see the results for yourself over at YEAR OF THE PEER podcast). Trust came more easily because I began my conversation with Leo by telling him upfront what I expected from this relationship. Better yet, I told him what I didn’t expect. Money, glory, fame. Those were not my goals. My goal, I told him, was guilt by association and my desire to be closer to this movement because I so firmly believe in it. The peer advantage is that important to me. So important, I told Leo, that I want to make it my life’s work for whatever time I have left on the planet. It’s my encore career. The stuff I want to do now that I have over 35 years behind me of running and operating businesses. Leo and I hold each other accountable in this relationship. From finding guests for his podcasts, to communicating with them and following up…all the way up to doing the voiceover work and editing the videos, then posting them in all the right places — I have my part to play in serving Leo and the cause. He shoulders his responsibilities to serve our listeners and viewers by trying his best to bring out the most in valuable conversations with each guest. We debrief our work and help each other try to achieve better results next time, always believing (dare I say knowing) we can do better. Always. That dissatisfaction of today’s work drives us to make his podcast better. It drives me to make this podcast better. Listeners will judge it, just as every business is judged solely by the market. The world doesn’t care what Leo and I think. The world determines if we provide value or not. It’s up to us to do our best and keep learning. It doesn’t mean the existing work isn’t good. It just means we believe our best work is still in front of us. And there’s two more elements of peer advantage talked about in the book: foster valuable interaction and be accountable. The only remaining element is a smart guide, a leader who knows how to facilitate so growth can happen. I’d argue that Leo and I have that, too. He’s in charge of YEAR OF THE PEER, but I’m very much a co-pilot. He’s mostly the smart guide in this, but sometimes I need to fill that role. We both recognize and bow appropriately to the duties as circumstances warrant because we know the objective – to do the best work of our lives. And we’re already two fairly accomplished guys who have more history than future. But we both know, understand and feel a sense of responsibility to the message – the truth we preach. Leo and I will both unhesitatingly tell you we’re still very much a work in progress in figuring things out. Individually and together. But speaking only for myself, I know this – without Leo Bottary being part of the circle of influencers in my life, I’m not where I am today – or with the hope of being where I want to go. 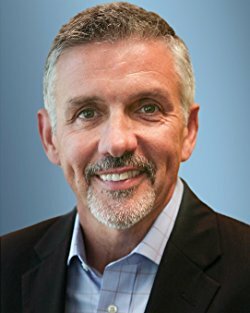 THE PEER ADVANTAGE podcast and my intended work of forming two charter groups of 7 small business owners from around the United States would not be possible without my having had the courage to reach out to Leo and his boldness in saying yes. So I’ll wrap this up by urging you to be brave. Be bold. Courage often looks like humility. And it absolutely looks like vulnerability. It’s a chance because you don’t know the outcome. You know what you hope and expect, but you have no guarantees except one – do nothing and you’ll be losing some of the potential greatest rewards ever. I wish for you and your business or organization all the best. Thanks for listening and paying attention. P.S. If you’d like me to send you a link where you can download a zip file of every episode in this series, including today’s show — just give me your email address in that opt-in box at the bottom of this post. I’ll have that FREE gift available by mid-August, 2017.